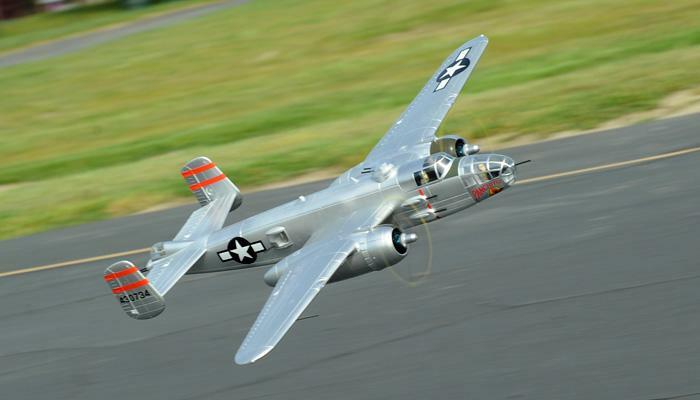 THIS IS FOR THE PURCHASE OF THE NEW METALLIC SILVER VERSION OF THE FMS B-25. The North American B25 Mitchell was a twin-engine medium bomber that served in every theatre of WW2. The aircraft was safe and forgiving to fly and featured a formidable array of firepower. It was also used to strike the first ever bomber attack on mainland Japan that boosted moral of the American war machine after the devastation caused by the attack at Pearl Harbour. Xtreme Hobby have chosen the B25-D which featured upgraded supercharge radial engines and increased armament and first flew in January 1942. This is a highly detailed and feature rich model and includes: 7 painted pilots, 11 machine guns, high power LED Navigational lights, worm drive retracts and with gear door sequence controllers. Taxiing and ground handling is great using the steerable nose wheel which makes for enjoyable and stress free take offs; again once in the air, all control surfaces are very effective and coupled to the light wing loading and excellent power make this a winning package. Confidence inspiring flight predictability will enable any budding enthusiastic pilot to really push the flight envelope and wring this aircraft out. At the same time it's a walk in the park to bring it back down for a beautiful scale landing, all this without the use of flaps! This aircraft is a twin powered "flight line stopper for the masses" so don't delay, order yours today!